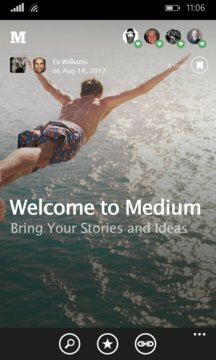 Mediummy is a Medium.com reader/client app for Windows powered by (Cortana) and (Cloud Syncing) to (sync) your current page & favorites between devices. Also, You can (search) content and (share) stories & publications with your friends. 1- (Cloud Syncing): Sync your current page and favorites between your Windows devices so you can continue where you left off. 3- (Cortana): is integrated with Mediummy; say to Cortana "Mediummy search for ........" then Cortana will open the app & find what you have asked for! 4- (Search): for stories, publications & profiles. 5- (Favorite): stories, publications & profiles, sync them between your Windows devices and read them offline too! With a lot more to come soon!! Buy it (once) on the Windows Phone Store and get it (free) on the Windows Store!! (Mediummy is a Universal Windows App). - Mediummy is an unofficial Medium reader/client app. 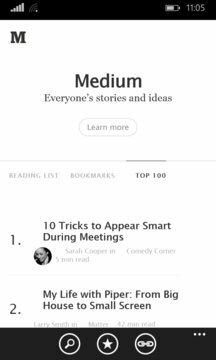 Content presented in Mediummy is already on Medium.com so Mediummy is not the owner or responsible for content on Medium.com. - Mediummy is using Medium.com mobile website view and the login functionality is provided by Medium.com mobile website not by Mediummy.